Vietnam is a war that still looms large in the American psyche, both in terms of its impact on modern history and its portrayal in popular culture. Yet for all the protests, rock n' roll and classic films that came out of the war, good Vietnam video games are hard to find. This is mostly because what made the war, what defined the nature of the conflict, wasn't something you could easily replicate in a game. Open wars, fought on battlefields between identifiable combatants, are easy. That's why there are so many shooters and strategy games based on the Second World War. Those wars had regions of control, and rules, and those are the kind of things you need for a video game. Vietnam did not. It was a war fought everywhere and nowhere. There were no front lines, enemies were tough to distinguish from friends (or at least the innocent). What defined it, then, was not a clash of arms, two sides meeting in open battle. It was the jungle, the mystery, the confusion. Games have found it tough to replicate this, most - Black Ops most recently - simply using it as a backdrop for just another corridor shooter, which captures neither the accuracy or the feel of the war. There's one game, though, that did. And it managed this back in 1993. 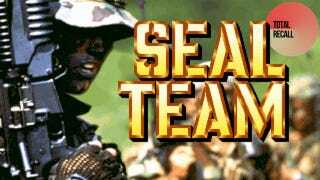 That game was SEAL Team, a shooter from Electronic Arts that was unwavering in its attention to detail, historical accuracy and adherence to the battles and tactics of the American forces in Vietnam. Set in the Mekong Delta region, the player was given command of a four-man squad of Navy SEALs, and was responsible for everything to do with an assigned mission, from allocating weapons and supplies to leading them in the field from either a first- or third-person perspective. Rather than set the action in artificial corridors, SEAL Team dropped you in large, expansive maps, similar in nature to those found in early Ghost Recon titles. Sometimes you'd be inserted via patrol boat, other times via helicopter, and your missions would vary from simple patrols to demolition missions to fire support control to complex assassination missions. While for the sake of player ease one of the war's biggest features - the "hidden" nature of the Viet Cong - was removed with combatants and civilians distinguished by the colour of their "pyjamas" - almost everything else tried to be as realistic as possible. The terrain could be difficult to see through, tall grass, trees, rivers and swamps making visibility difficult (but also providing you with avenues of cover and approach). Villages could be rigged with booby traps, which in a neat touch had to be identified by the player so that his squadmates didn't fall victim to them. And in nods to more complex shooters seen later (like Operation Flashpoint), you could even call in fire support and extraction via radio. Actually, those who enjoyed Flashpoint (and ArmA) will find many similarities with combat in SEAL Team, like the emphasis on tactics, squad deployment, management of supplies and especially the brutality of a one-shot-can-kill-you mechanic. Since the game is no longer commercially available, it's free to download.